The night train (reclining seats and all) was probably more comfortable than all of the night buses (with beds) we'd taken on our travels. Sure, you don't get to lie down, but there's at least more leg room so you don't feel as much like a sardine, and the driver isn't pounding the horn every 5 minutes. I must have managed a good 5 or 6 hours sleep: a new record. When we arrived, we were ushered onto the transfer bus to the ferry pier, and then onto a high-speed catamaran at just after 8am. The catamaran ride was possibly the worst journey I've ever experienced. "High-speed" means hurtling over waves (sometimes literally) at breakneck velocity, whilst passengers in every direction vomit into bags. Gilly and I kept our eyes on the horizon and tried to control our stomachs (not that it would have made any difference to me if I'd wanted to be sick...) and, incredibly, managed to doze for a good third of the hour and a half journey. One woman to my right was being sick so much, I was half expecting part of her intestine to make an appearance at some point during the ride. On the catamaran we met a rep from Ban's who was touting dive courses. We knew that Sunshine Divers (the place we'd been recommended by some people we met in Vang Vieng) was part of Ban's but had smaller groups, so we asked him about it - he was happy to arrange a free taxi to take us to the resort from the pier once we arrived and left the Sick Boat. Sunshine Divers is basically an office surrounded by a few shaded verandas, a restaurant, a small bar, and a beach. 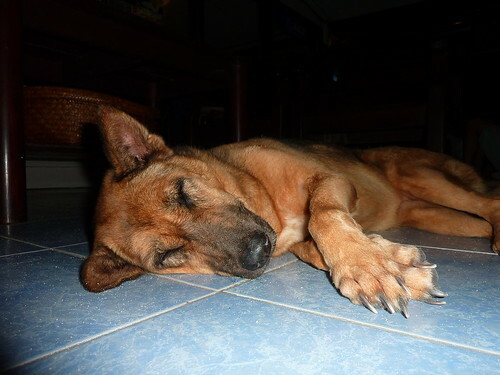 They also have a dog, Huey, who has been there for as long as the centre has existed, if not longer. She is very protective of her turf, and will bark and howl at any dogs that dare cross into the area...when she's not sleeping, that is. There are bungalows a few metres away, and you can stay there for free if you're taking a diving course. Just as well really, as they are dire. One of the instructors - Manuel - got us bumped up to the hot water bungalow for free (you usually have to pay £4 a day more for the privilege of not freezing in the shower), but even that didn't really help. The bed was uncomfortable, there was an overabundance of ants, and the room wasn't cleaned the entire time we were there. I guess the adage of "you get what you pay for" was in full force here. However, we decided to do the course regardless, and were glad we did. Our instructor Bastiaan was a PADI-certified Staff Instructor, one level below Master Instructor - the top qualification you can get. I think we were pretty lucky to get him, as he certainly knew his stuff. He also told us that the accommodation was actually nothing to do with Sunshine Divers - it's owned by a landlord who turns up once or twice a year and demands the rent. Also worth noting is the fact that if you decide to stay elsewhere, you get a discount on your course. We didn't learn this until we were about to take our advanced course, but it may be useful to anyone thinking of diving. I definitely recommend staying in a different place - we ended up moving to Sunshine 1, literally next door. However, I'm jumping ahead. After deciding to do the course, we met up with Ally from Oregon who was also doing the course with us. 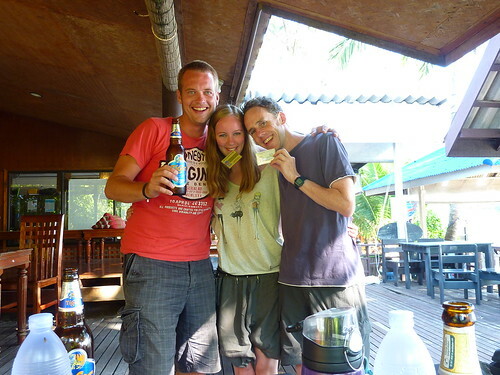 Three of us with 1 instructor and a divemaster in training (Sarah-Jane) - excellent. the evening was taken up with watching DVDs of the PADI course materials. Fairly unexciting, but necessary. The next day, we went to the pool at Ban's resort at 8:15am to get kitted up and start practicing our skills underwater. 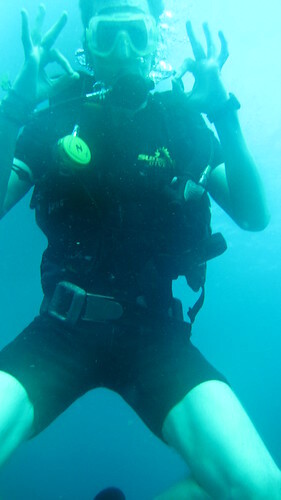 This wasn't the first time we'd worn scuba gear; we'd done a try dive in Skiathos 2 years earlier. 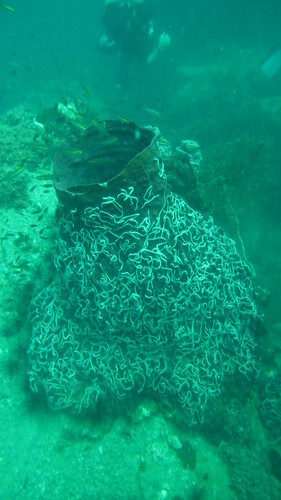 That was pretty much straight in the deep end - gear on, dumped in the sea, swimming around a bit. I'm glad we did it as it wasn't a completely new experience. We had to tread water for 10 minutes, take our mask off underwater, get neutrally buoyant (so you effectively "hover" underwater, moving up and down solely by breathing in and out), and do a number of other skills in a relatively "safe" environment, which we'd then have to replicate later in the sea. Gilly had a few issues taking her mask off but by the end of the session was far more confident. In the afternoon we did our first knowledge review and test exam, which also went pretty well. On our third day, we were up at 7:15am to go on our first two dives. The first was to the Twin Peaks (known as the Twins), whilst the second a couple of hours later was to White Rock. We only practiced a couple of skills on these two dives, as Bastiaan wanted to ease us into the diving process, so we recovered a lost regulator, cleared a partially-flooded mask, and practiced being out of air which involves telling your dive buddy you're out of air, taking his alternate regulator to breathe from, then ascending to the surface. In the afternoon, it was more knowledge reviews and tests followed by a final exam which I passed with 90% (Gilly got 92%!) and that was pretty much it for the theory side of things on the standard Open Water course. The final day of the course consisted of two more dives to the same sites in reverse order - White Rock, then Twins - where we practiced more skills. These included mask removal and replacement, weight belt and Buoyancy Control Device (BCDCESA) and towing a tired buddy on the surface. 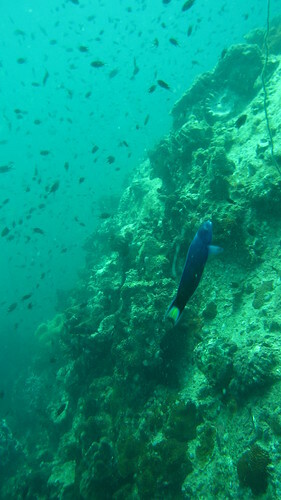 During the dives we got to see a lot of fish: angelfish, parrotfish, bannerfish, clownfish, a school of barracuda, various wrasses, and a moray eel hiding in the sand. 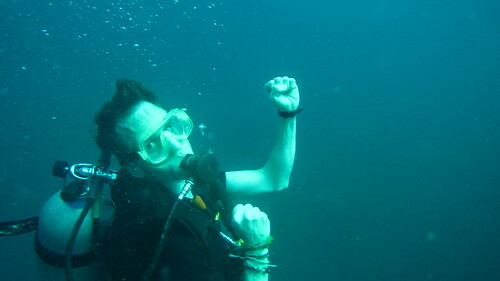 We were becoming a lot more confident underwater, although I had a tendency to use a lot of air each dive as I found it hard to keep my breathing slow and steady. We thought it would be a good idea to bed in what we'd learned at the end of the Open Water course by doing the Open Water Advanced course which would give us another 5 dives under our belt and let us dive to 30 metres, instead of the 18m limit which the standard course provided. We did 2 compulsory modules (navigation and deep dive) and 3 electives - we chose night dive, peak performance buoyancy, and fish identification. 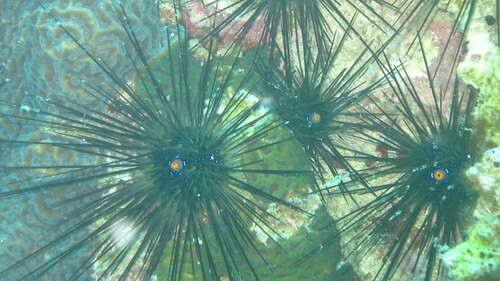 The first day of the course was the deep dive at Southwest Pinnacle: we went down to 27.2m. It was pretty scary how easy it was to get down so deep in such a short space of time. When you get deeper, the amount of air you use up increases dramatically due to pressure - you can't stay down there too long. The next dive was navigation: we got dropped off with Ally at one point of the dive point (King Kong) and had to navigate our way to another point and record the depth on our dive computer. I was in charge of drawing and holding the map for the dive, Ally had the compass, Gilly was using natural navigation and keeping an eye on landmarks. Anyone who knows me will know that I have no sense of direction. I'd probably get lost in my own house if I was left unattended. So giving me a map and asking me to guide us to a location was possibly a mistake. It didn't start well. I initially tried to take us in completely the opposite direction, but thankfully Ally was competent with a compass and she pointed out that north and south were in fact two different directions. After some swimming around and not finding the point we wanted, she managed to guide us back to the buoy rope before we ran low on air. Bastiaan was pretty impressed that we surfaced where we started. I guess it's not the easiest task to undertake. The final task of the day was a night dive back at the Twins. I wasn't particularly concerned about this. Some people have an innate fear of swimming in the dark, but I had complete confidence in Bastiaan's ability by this point - to be honest, he'd made things easy from the start for us - and I was looking forward to seeing some different fish and other nocturnal sealife. We were kitted out with torches and set off swimming. 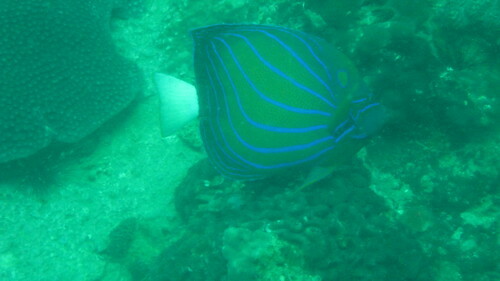 We saw a hermit crab, a Jenkins ray and a moray eel; we ended up following the ray around a bit, and it seemed fearless: it headed straight for us along the sea bed and we swam up a bit to let it pass. We sat at the bottom and held our torches against us so we were in darkness. It was the night before the full moon and we could see it peeking out through the water above. We did some navigation with a compass to a spot about 20m away and back, whilst the others turned off their torches to ensure we relied on the compass. There were no dramas - Gilly's torch stopped working immediately, but Bastiaan had two spares - and the dive was great. Unfortunately, I somehow managed to burn through my air at a ridiculous rate. When I looked at my gauge, I had 80 bars left (Bastiaan treats 70 as "low" for safety) - a couple of minutes later I was down to 40, and signalled that I was running pretty low....by the time I got over to Sarah-Jane I was on 10 bars. We had to do an ascent with me using Sarah-Jane's alternate air source. She had almost 100 bars left, perhaps the result of experience, yogic breathing and some sort of superhuman lung capacity. So she theoretically saved my life, which was handy as we had a good 8 months travelling still to go. Unfortunately we surfaced a good 100m from the boat, a combination of coming up early and Sarah-Jane getting a tad lost, so had to do a surface swim. Bastiaan hates surface swims, and I can see why. My fins (I wasn't allowed to call them flippers) had been slightly too small for the open water course, and as a result my feet were cut and bruised. I'd switched to bigger fins for the advanced course which was better, but doing a long surface swim is far, far more difficult than swimming underwater and as a result my feet were screaming at me by the end. 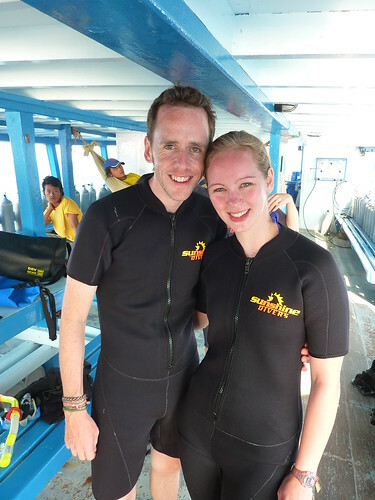 I have no frame of reference to compare Sunshine Divers to other dive schools, but I can certainly say that we enjoyed our courses, felt completely confident in our instructor, and appreciated the small groups. We saw a couple of Ban's classes - they had 8+ people in the water at once. I'm no expert, but I think that's far too many people for an instructor to keep an eye on at once. There are plenty of other 5-star accredited PADI schools in town (and around the island), but I'm glad we went where we did - it was a quieter part of the island so we weren't kept up at night by late parties and clubs. I'd definitely recommend sleeping elsewhere and negotiating a discount on the course though. At 9000 baht for a 4 day course, you could probably get it for 8500 if you moved elsewhere, and be more comfortable. We did just that for the advanced course and moved to Sunshine 1 just next door which had hot water and a slightly more comfortable bed. After our courses were done, we moved to Infinity guesthouse (which had a massage parlour downstairs) so we were closer to the pier for our ferry to Koh Pha Ngan. It's owned by a Belgian and run by a Frenchman called Eric who was very accommodating, the pair of them drove up on bikes to pick us up free of charge which was appreciated. The taxis in Koh Tao seem to operate a cartel which keeps prices at a minimum of 100 baht per person (200 baht at night), and it soon adds up. The room was cold shower only, but wasn't an issue, and the beds were a lot more comfortable. However, there are dozens of guesthouses and resorts in the town - we just settled on the first one that met our needs and budget. If we came here on holiday we'd probably plump for something a bit more upmarket on the beach. 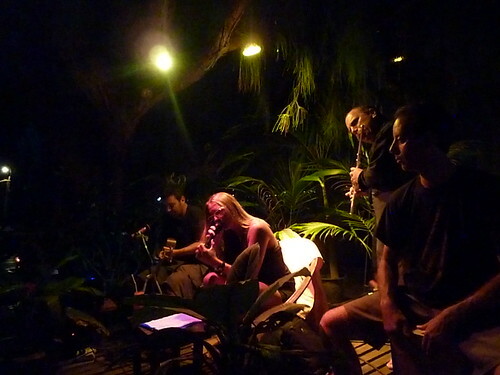 On the last night though, there was a beach band playing at Sunshine Divers, which was basically a jam session. It was a bit odd - the guitarist was good, the "drummer" played an over-sized box which worked surprisingly well, but the singer killed most of the songs and was sat down the entire time...and for some reason there was a flutist. He appeared to play the same notes in every song, and added nothing to the music. There was some respite when he fell off the stage onto the sand, but unfortunately he was able to resume playing. 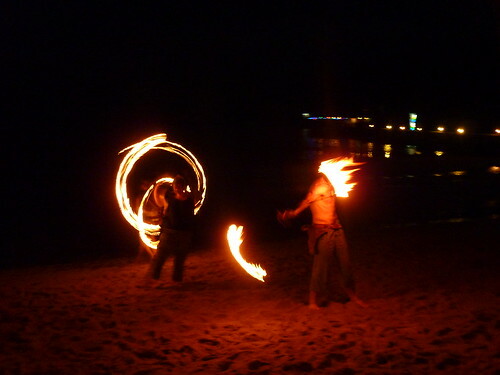 There were also some fire-dancers on the beach. - Tukta: Ally recommended this place but we were a little disappointed. The penang curry was OK but the fish was pretty tough and the food took an age to get to us. Ally went not long after and was also fairly unimpressed - she said it was much better a few years back. - Toscana: We ate here twice. They do the hottest green curry (with roti bread) I've ever eaten. I'm not kidding; it blew my mouth off, and was the spiciest thing I ate since the first night in Bangkok (which, strangely, was also a green curry with roti). They also do cracking deep fried salt and pepper calamari. Second time round we went for the fried platter of wontons, spring rolls, "golden bags" and fishcakes, with a seafood fried rice. All pretty nice, but possibly not the healthiest combination of food to share - we felt pretty greased out afterwards. - Cappuccino: Ate here twice as well, they do a decent sized burger and some good sandwiches. Gilly can attest to the quality of their salads as well. - Taraporn: Just up a pier near Sunshine Divers, these guys do the best garlic bread we've eaten since we started travelling. The chicken satay and prawns were excellent too. 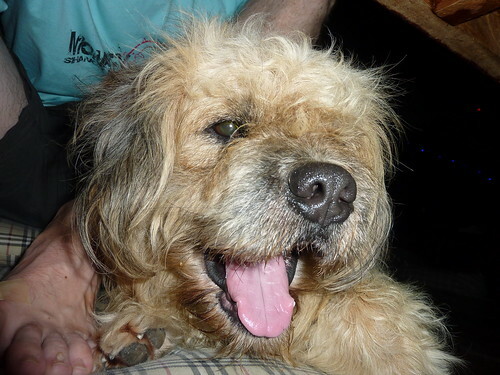 And they have a very cute dog - what more do you need? - Whitening: The best place we ate at on the island, with prices to match (almost £20 for a starter, two mains, a side dish and two cocktails). The fishcakes were excellent, as was the penang curry and the "exotic prawns". The mojito I had was superb. 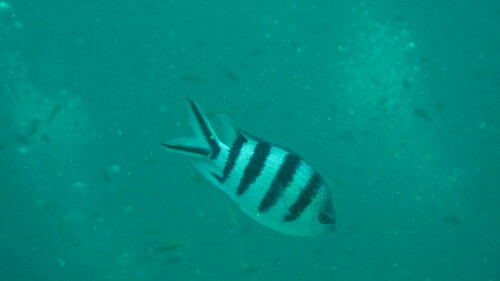 Koh Tao was a great island to learn to dive on. 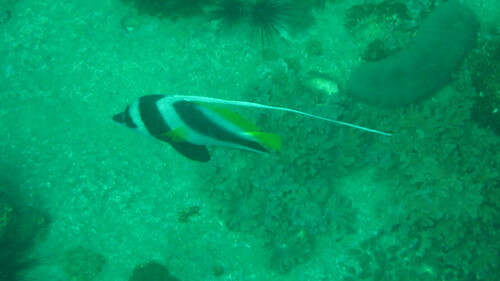 Sairee Beach would make a decent, if busy, place to take a holiday too, if you aren't interested in diving. 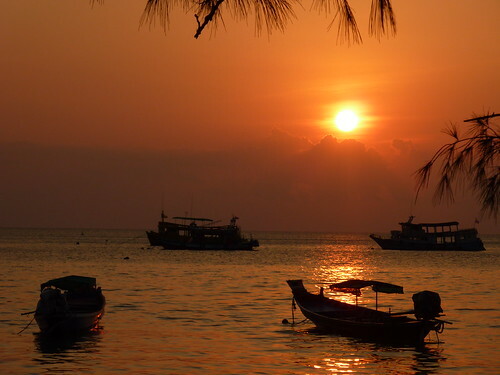 Our next destination was Koh Pha Ngan, where we'd be meeting with Paul and Fi again, and also Colin and V who have flown over to SE Asia for a whistlestop 3-week vacation. I'd found a beach front resort called Lime N Soda which looks like it ticks most boxes and seems ideally located for town as well, so we're looking forward to catching up with friends again shortly.